Product prices and availability are accurate as of 2019-04-19 13:25:17 UTC and are subject to change. Any price and availability information displayed on http://www.amazon.com/ at the time of purchase will apply to the purchase of this product. 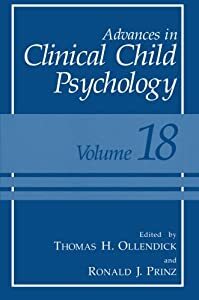 As in past volumes, the current volume of Advances in Clinical Child Psychology strives for a broad range of timely topics on the study and treatment of children, adolescents, and families. 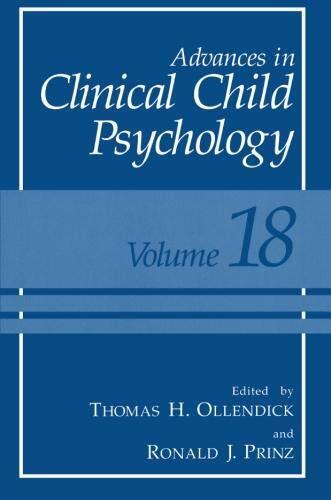 Volume 18 includes a new array of contributions covering issues pertaining to treatment, etiol­ ogy, and psychosocial context. The first two contributions address conduct problems. Using quali­ tative research methods, Webster-Stratton and Spitzer take a unique look at what it is like to be a parent of a young child with conduct problems as well as what it is like to be a participant in a parent training program. Chamberlain presents research on residential and foster-care treatment for adolescents with conduct disorder. As these chapters well reflect, Webster-Stratton, Spitzer, and Chamberlain are all veterans of programmatic research on treatment of child and adolescent conduct problems. Wills and Filer describe an emerging stress-coping model that has been applied to adolescent substance use and is empirically well justi­ fied. This model has implications for furthering intervention strategies as well as enhancing our scientific understanding of adolescents and the development of substance abuse. Foster, Martinez, and Kulberg confront the issue that researchers face pertaining to race and ethnicity as it relates to our understanding of peer relations. This chapter addresses some of the measurement and conceptual challenges relative to assessing ethnic variables and relating these to social cognitions of peers, friendship patterns, and peer accep­ tance.